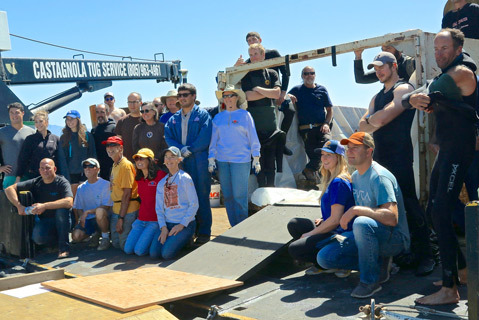 A small army of volunteers cleared a half-ton of junk from Marina 1 in the Santa Barbara Harbor this weekend. The ninth annual cleanup tackled areas around some of the newer docks — they’re only 15 years old — but still yielded a veritable treasure trove of trash. The 18 divers helped by 30 dock volunteers hauled up bicycles, cell phones, sheet metal, beer and wine bottles, a wooden ladder, a toilet, and a laptop. 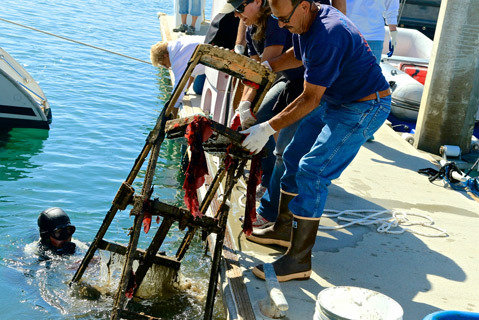 18 divers and 30 dock volunteers took part in this year's cleanup.